Brokerage Barnard Jacobs Mellet Securities has revised its share price target for telecommunications group Vodacom sharply downward in anticipation of a significant fall in interconnection rates in SA that could hit the group’s profits. BJM Securities has also lowered its target price for MTN, but not to the same degree as Vodacom, given that the former is less exposed to the SA market. Combining the effects of voice-over-Internet Protocol (VoIP) technology and lower mobile interconnection rates, the “longer-term profitability of the mobile operators looks under threat”, BJM Securities says in a report to its clients. Ebitda is a financial term meaning a company’s earnings, before interest, tax, depreciation and amortisation. BJM Securities has downgraded Vodacom from “overweight” to “neutral” and slashed its target for the share price from R84 to R60; it has cut its target for MTN, which is much less reliant on the SA market than Vodacom, from R124 to R120 and remains “neutral” on the share. At lunchtime on Wednesday, Vodacom was trading down 2,7% at R54,84; MTN was up 0,9% at R125,67. Political pressure is mounting for interconnection rates, the fees the operators charge one another to carry calls from each other’s networks, to drop. The rates the mobile operators charge — R1,25/minute in peak times — looks set to be reduced, with potentially big implications for their long-term profitability. Industry regulator, the Independent Communications Authority of SA (Icasa), on Tuesdsay met with the big operators, which have all agreed to produce a findings document by end-December on how rates should be brought down. 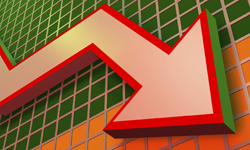 Icasa wants interconnection rates to begin falling as soon as February 2010. The 35-page BJM Securities report examines in detail the financial implications of a sharp cut in mobile interconnection rates. It also contemplates a “worst-case scenario” for the mobile operators. The report finds that the “downside profit risk for the mobile operators seems to be far greater than for the Telkom fixed-line business”.